St Patrick's Maghera beat St Colman's Newry 1-10 to 0-11 in their semi-final replay to reach the MacRory Cup decider, where they will face St Paul's Bessbrook on Monday 18 March. Danny Tallon scored the only goal of the game for St Patrick's after just three minutes. 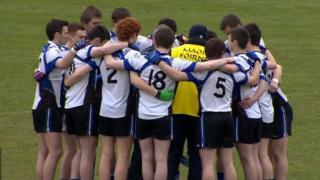 The Maghera school led 1-5 to 0-6 at half-time and consolidated their advantage to run out two-point winners.